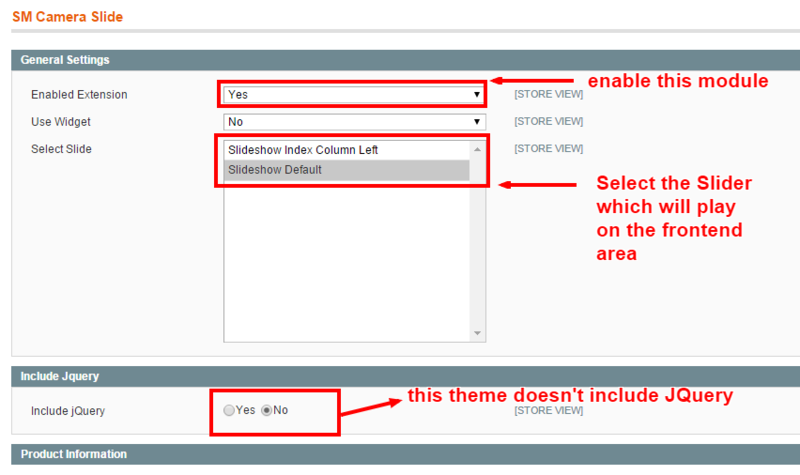 This guide will help you install SM G2shop themes step by step. 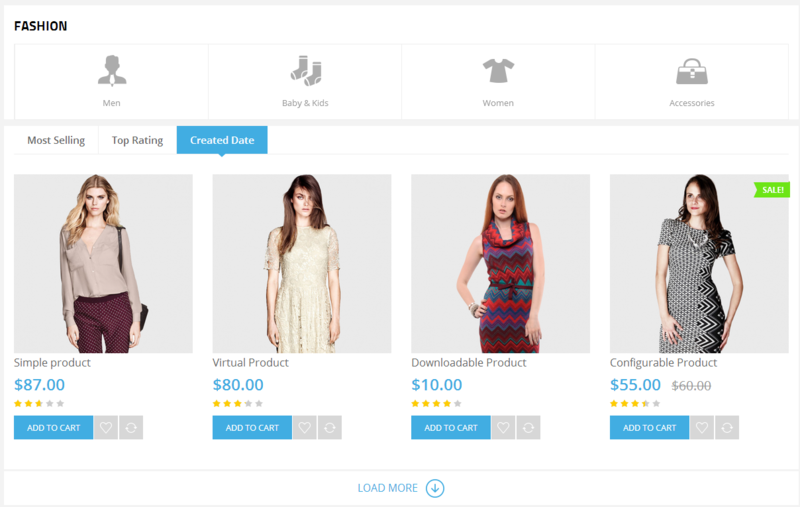 Manual Installation (include of Theme Installation Package): You will need only be using the zipped files “sm_g2shop_theme_m1.7.x-1.9.x_v1.0.3.zip”. 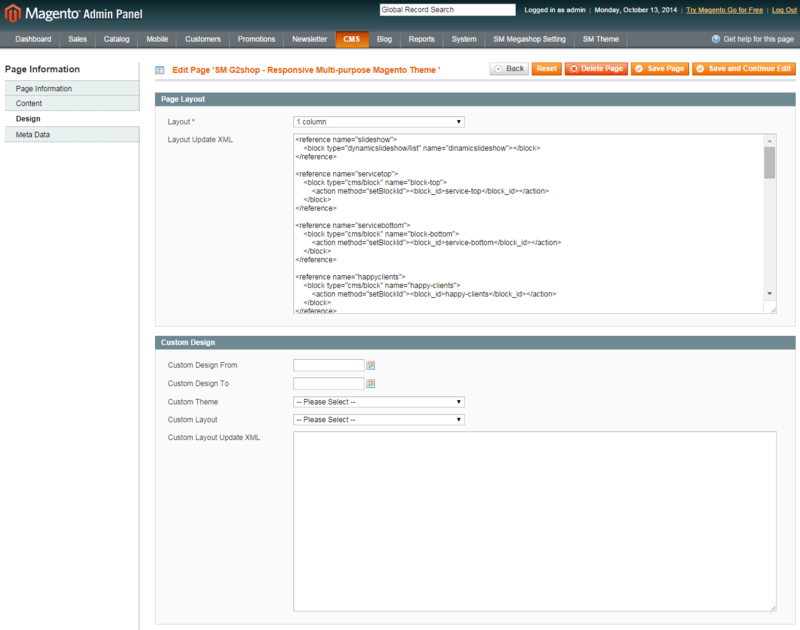 Step 2: Log in to your Admin Panel on the stage localhost (e.g. 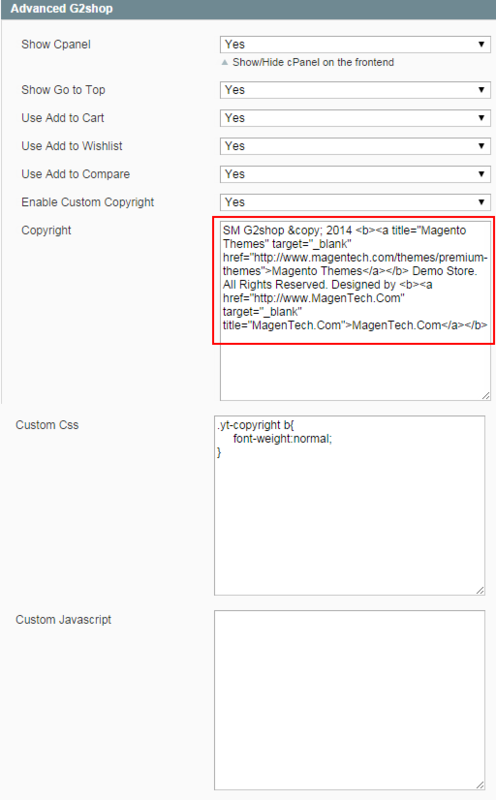 Access Magento Admin area: http://localhost/index.php/admin/). Log out and log in back. 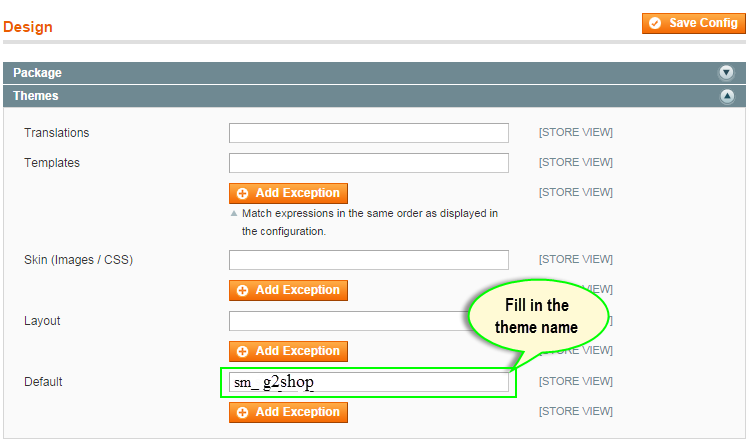 Step 5: In Themes tab, input Default field with the actual theme name. 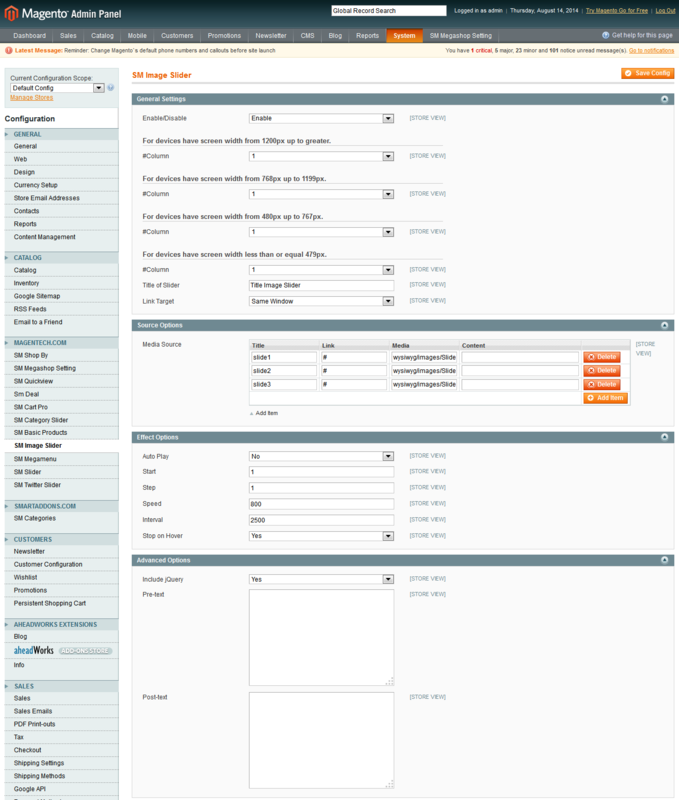 Link show Home Menu’s backend. Please click Here to view. 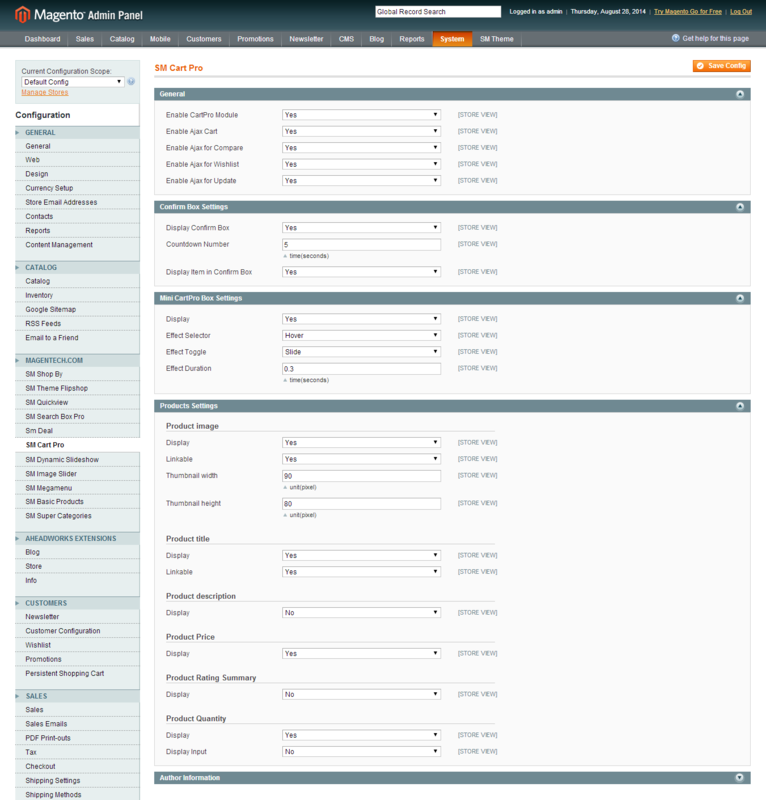 Link show Electronic Menu’s backend. Please click Here to view. 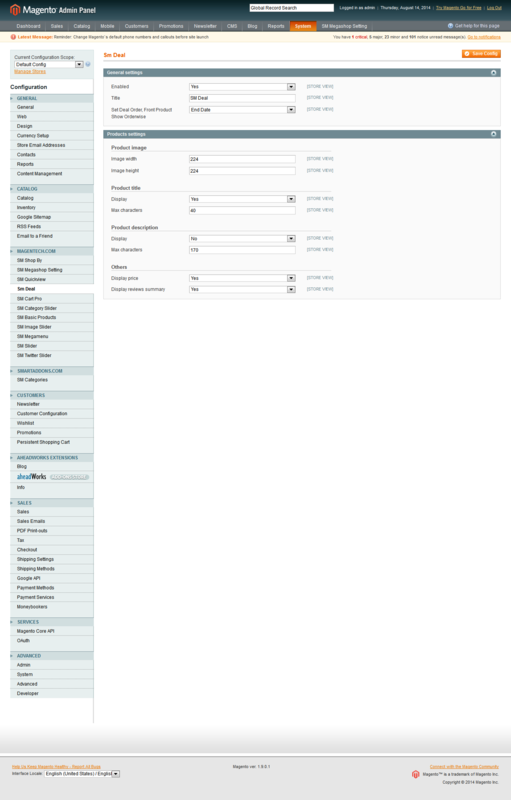 Link show Men Menu’s backend. Please click Here to view. 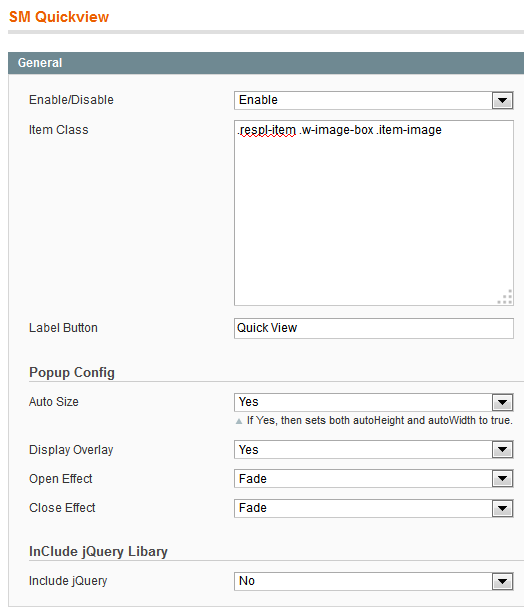 To configure the quickview image as demo, please go to System >> Configuration >> find SM Quickview module (in the left hands) to configure. Click Here to view details. 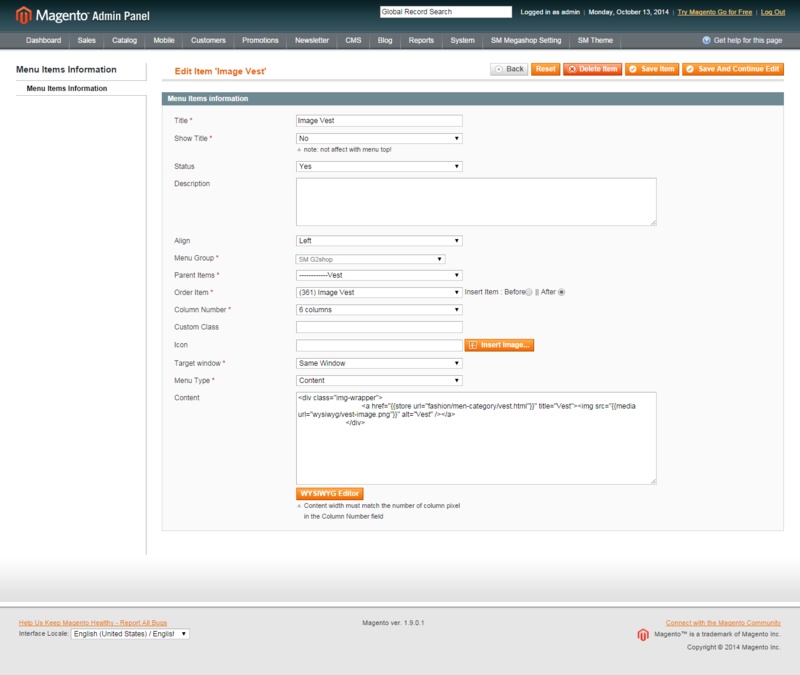 Step 1: Login to your Admin Panel on the stage localhost:. 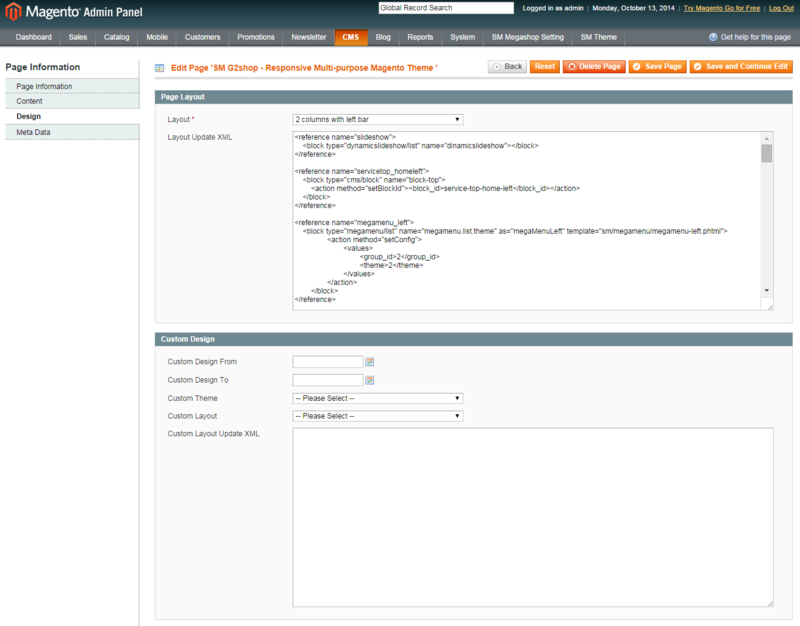 Step 2: Navigate to CMS >> Static Blocks. 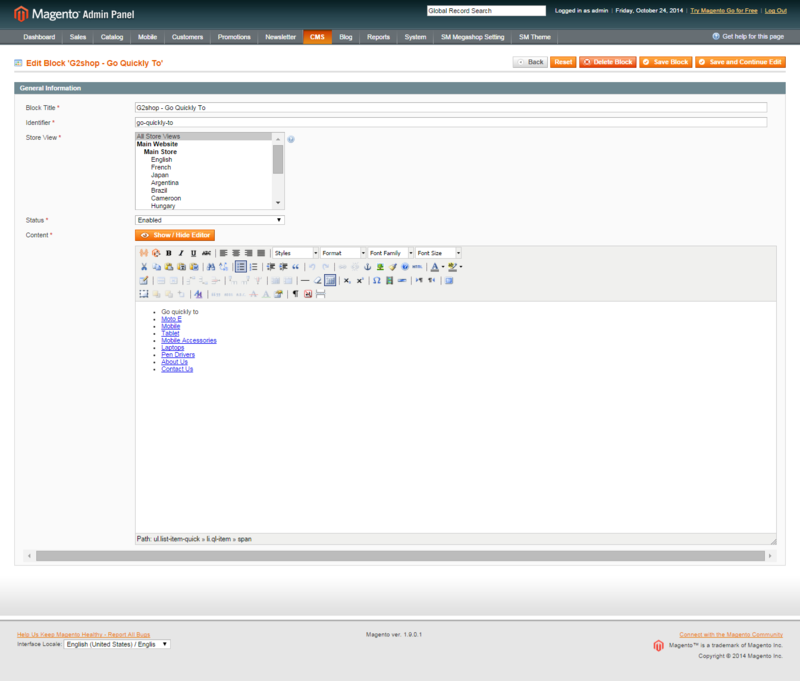 Step 3: From the Static Blocks page, click the [+Add New Block] button to create a new Static Block. 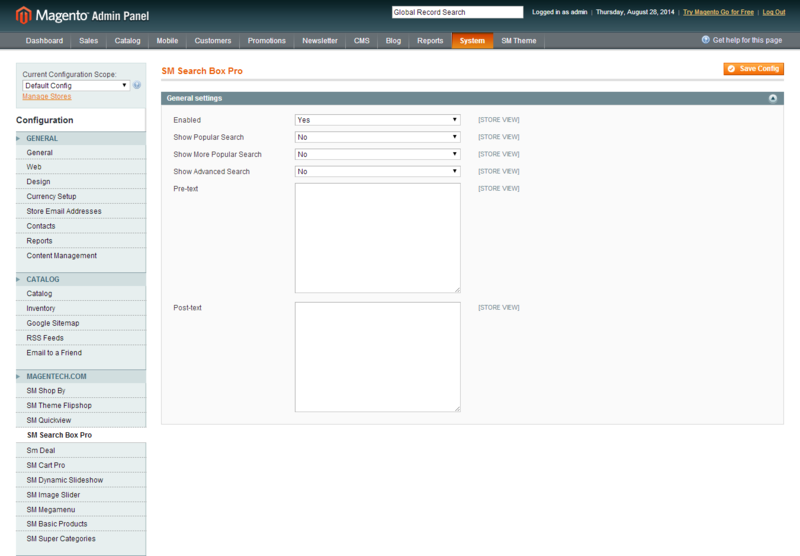 The New Block configuration page will open. Block Title: Define a relevant title for this block of content. Identifier – Define a unique identifier. A recommended guideline is if your title is ai?? ?My Special Title,ai??? your identifier should be ai???my_special_title.ai??? 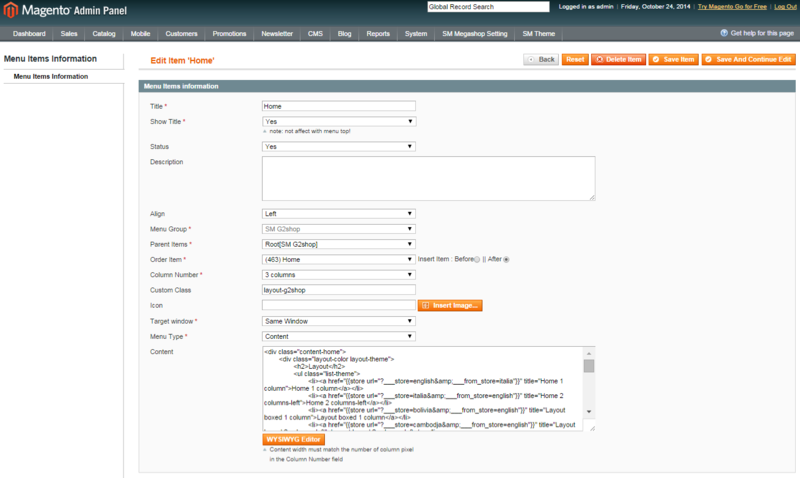 The identifier is used to manipulate data blocks using XML code. 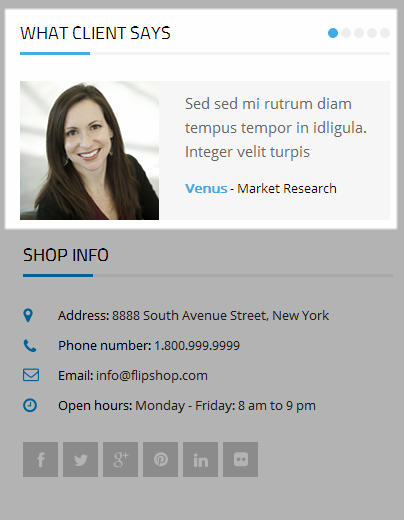 It is not visible on your storefront. 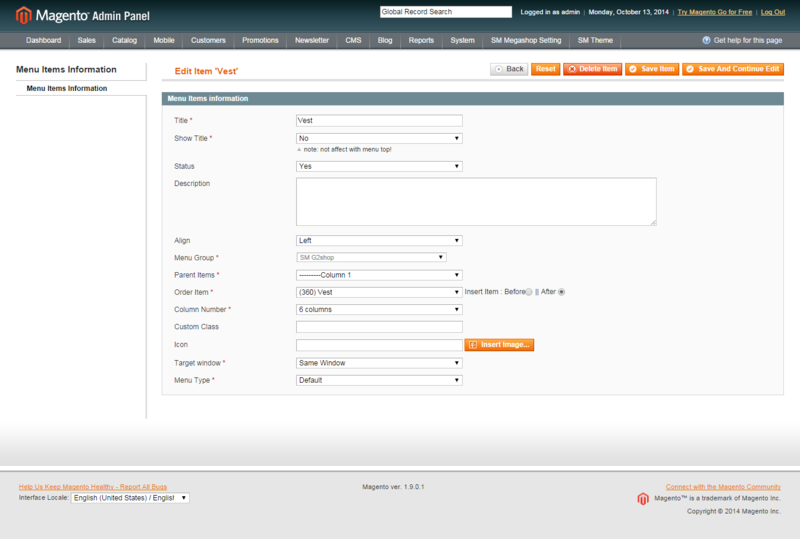 Store View – Select the store view(s) this content block will be visible or All Store Views to include all. 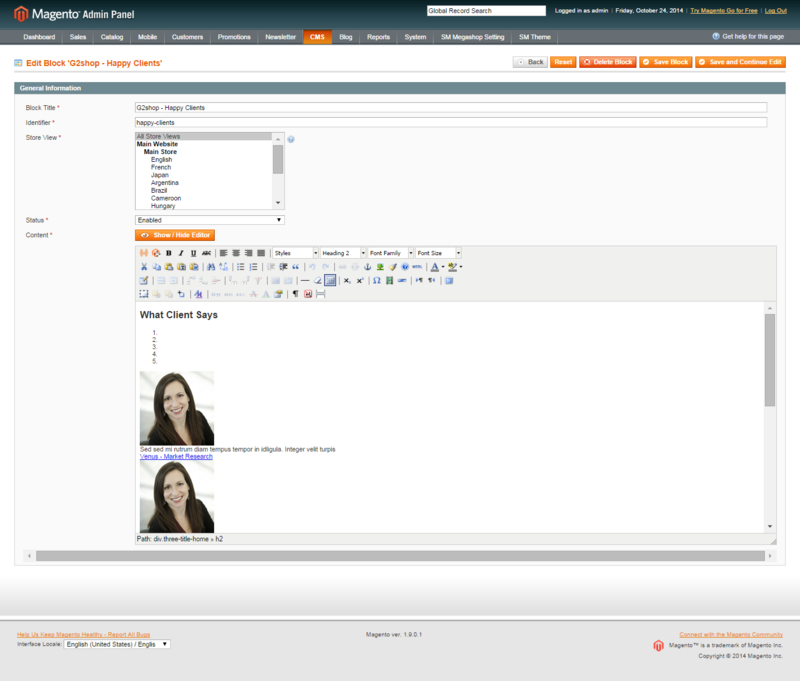 NOTE: Store View field will be visible only if you have set multiple store views. 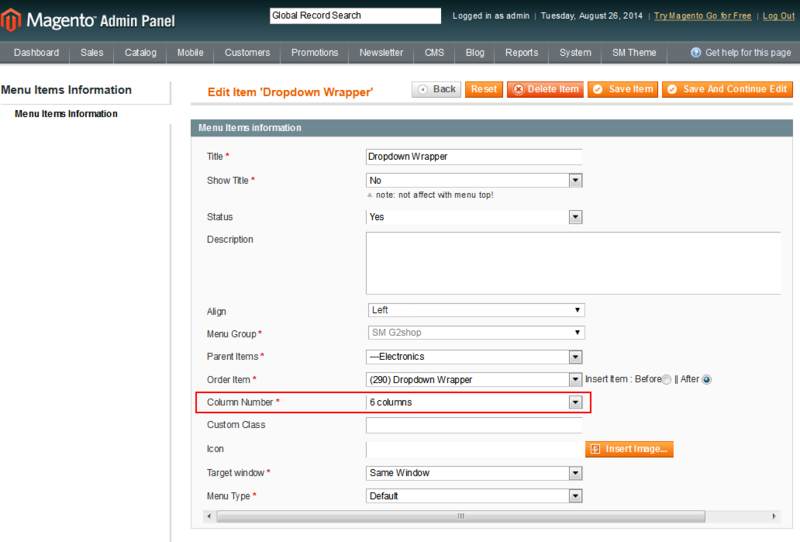 TIP: To select multiple store views, use Ctrl + Click when selecting from the list. 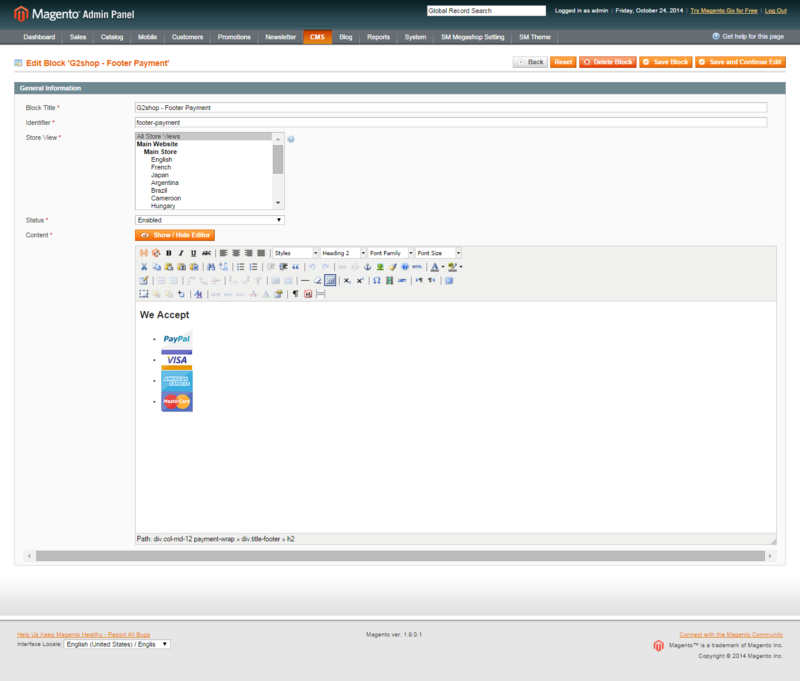 Status – Select Enabled to make this static block visible on front-end. 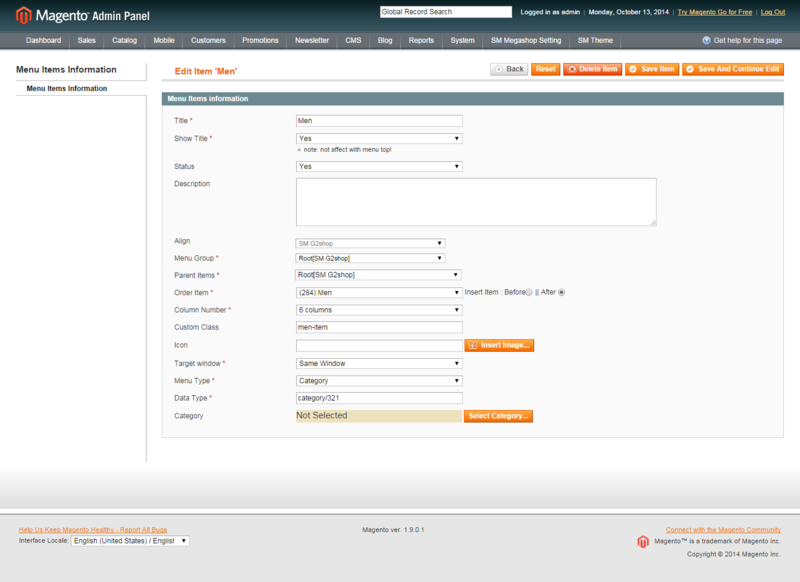 Content – Fill in with the content for this static block. 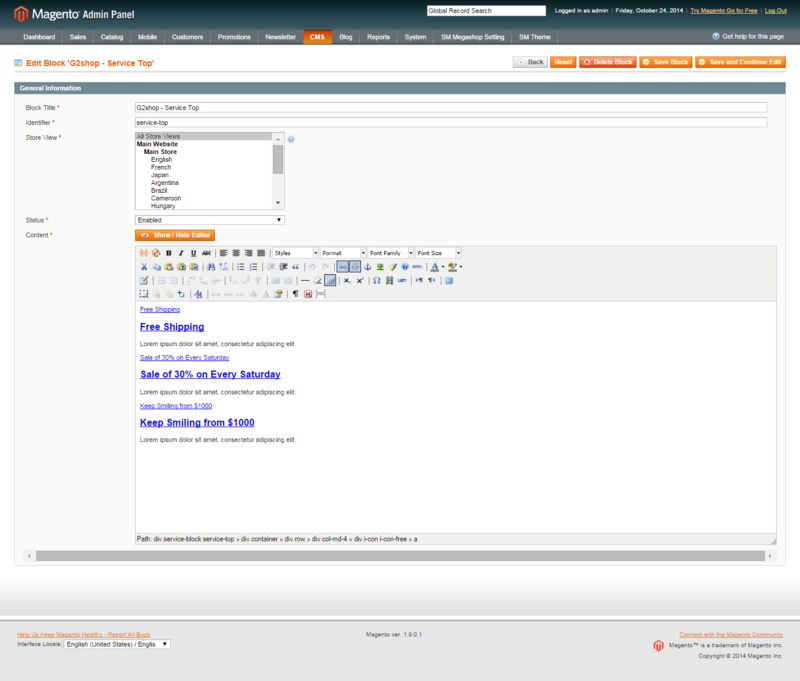 You can use the WYSIWYG Editor (visible at the top of the textbox) to format text, create links and tables, or add images and media. 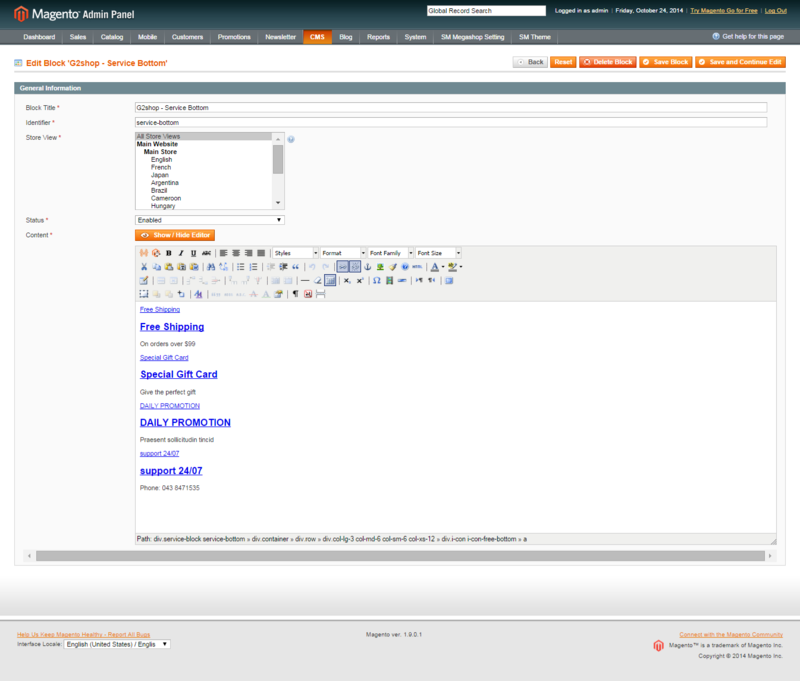 To learn more about how to use the WYSIWYG Editor, see ai?? ?Tips on using the WYSIWYG editor.ai??? Once you have filled in content and configured the static block, click the [Save Block] button to save your changes. 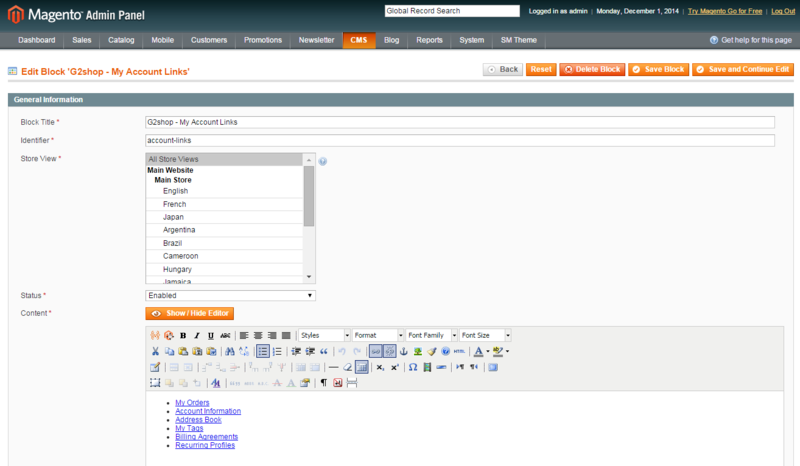 Link show Backend of G2shop – My Account Links. 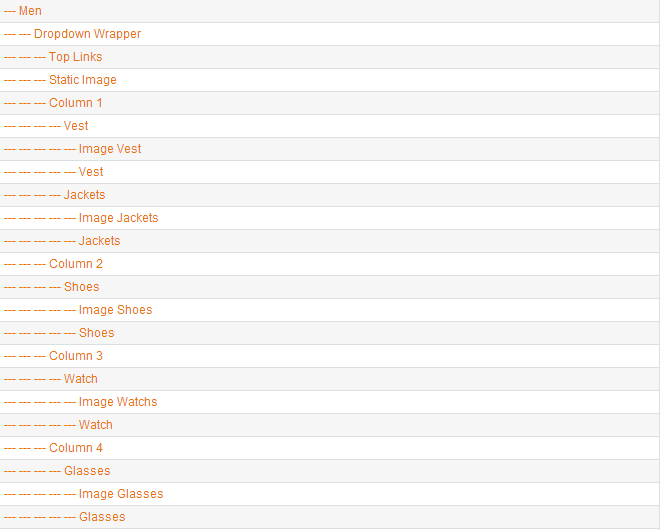 Link show Backend of G2shop – Go Quickly To. 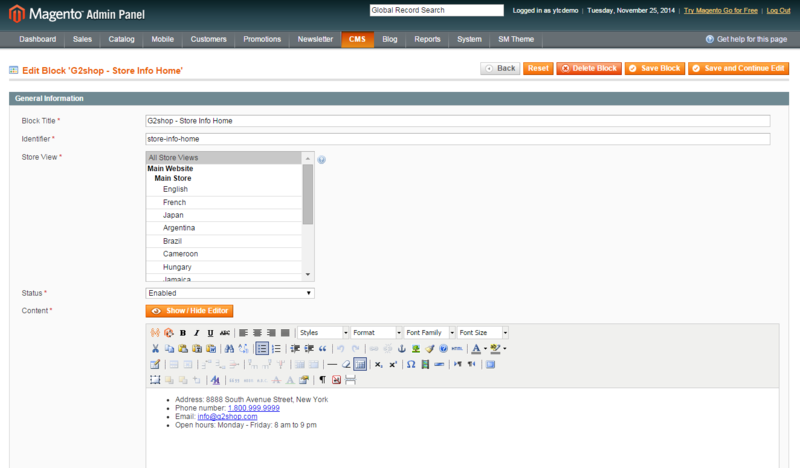 Link show Backend of G2shop – Service Top. 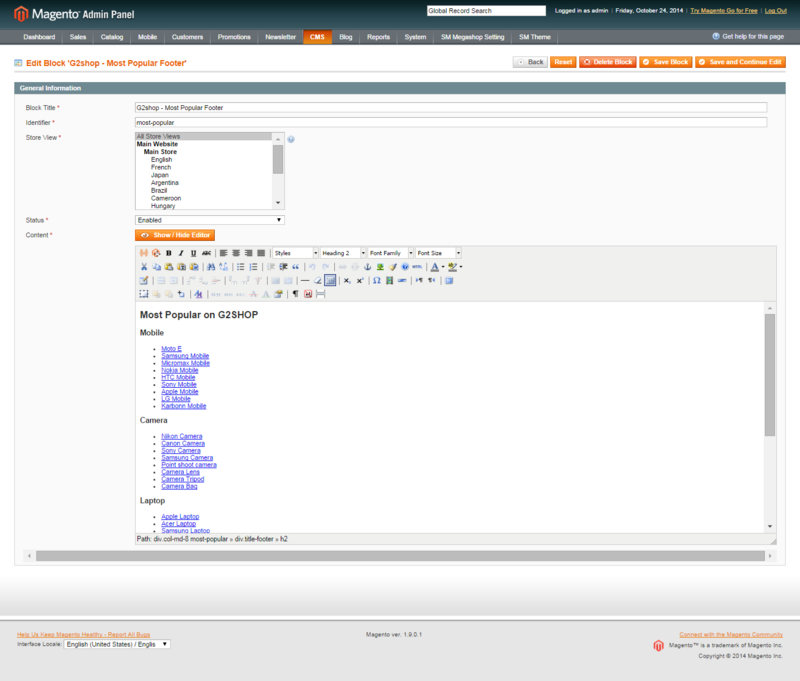 Link show Backend of G2shop – Static Image Center. 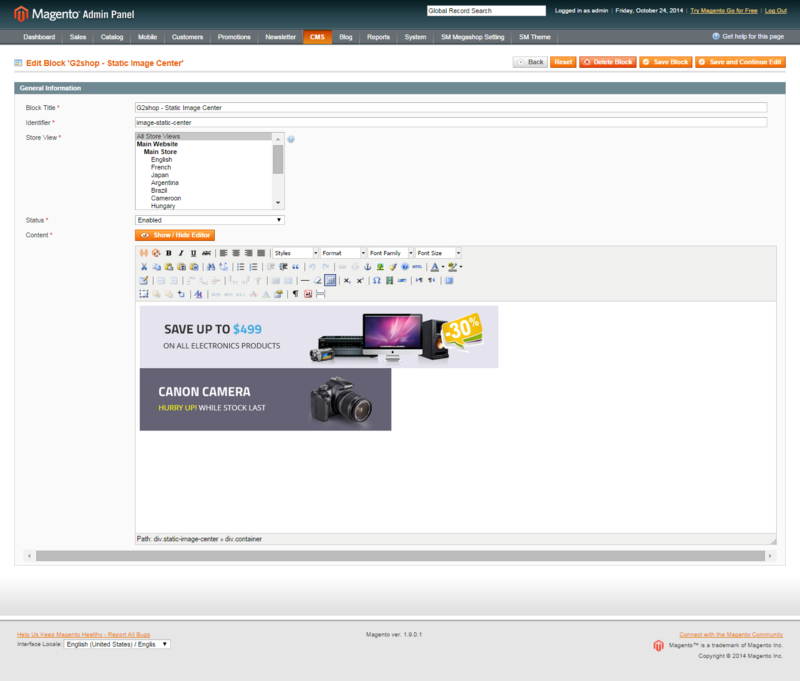 Link show Backend of G2shop – About Help Footer. 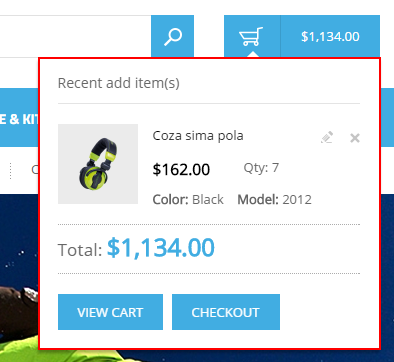 Link show Backend of G2shop – Footer Payment. Note: To edit content of “Subscribe“, please go to your installation directory url : app\design\frontend\default\sm_G2shop\template\newsletter and edit footer-subscribe.phtml file. 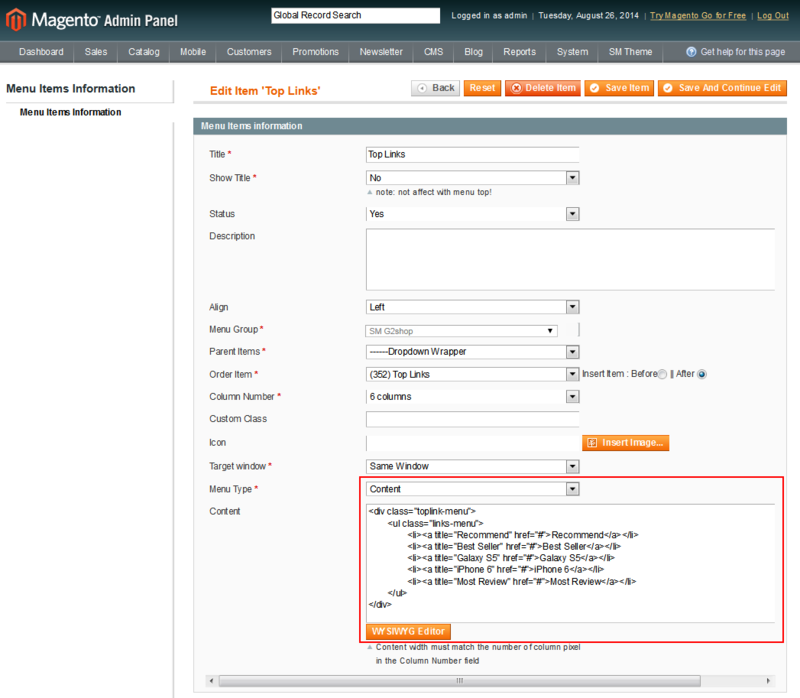 In your Administrator Panel, please go to System >> Configuration >> Click Ai? 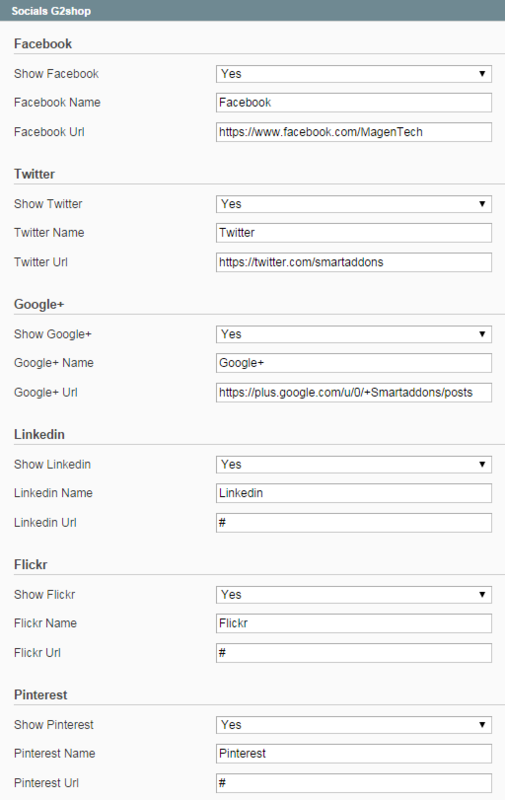 ?“Design” (in the left hands column) >> find Header tab >> edit “Logo Image Src” field and “Welcome Text” fields as you want. 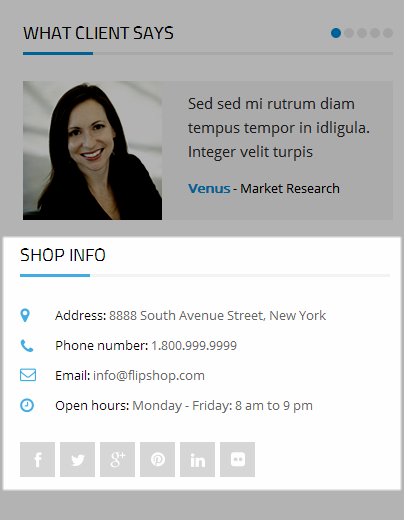 Note 1: To edit Logo image of “G2SHOP“, please go to your installation directory:Ai? 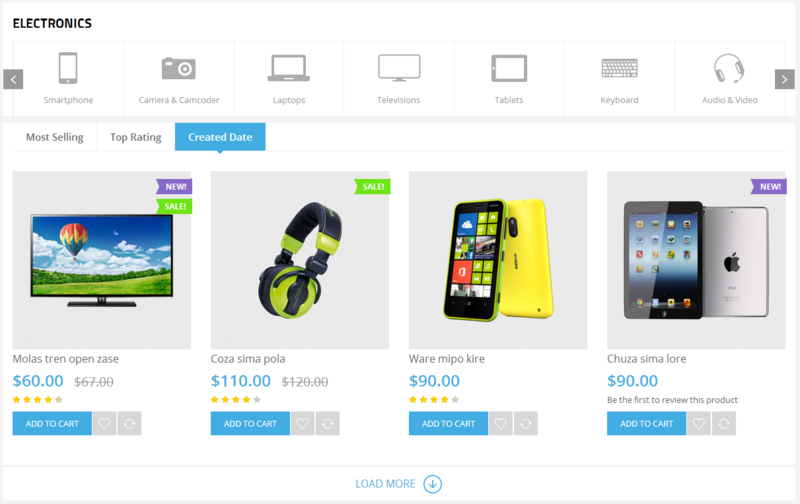 ?\skin\frontend\default\sm_g2shop\images to edit logo image as you want. Note 2: Please edit Text in “Welcome Text” field as you want. Note:Ai? ?Please go to your installation directory url : “\app\design\frontend\default\sm_g2shop\template\page\html” and click Ai??”header.phtml”Ai?? file to edit. 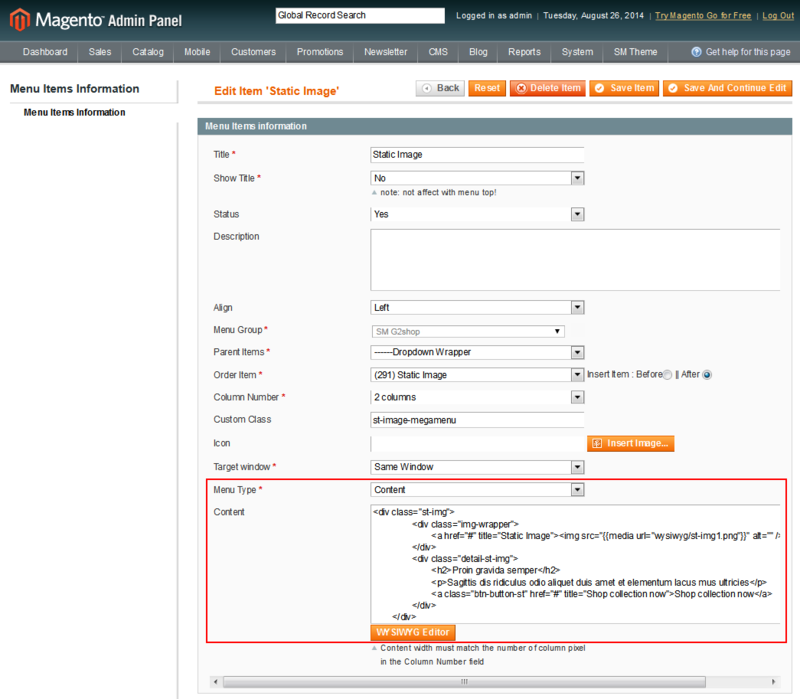 Please go Here to readmore How To Set Default Language and Currency in Magento.